The Clinic for Nerve and Mental Diseases and at the same time Department of Psychiatry and Neurology were established on October 10th, 1923. It was the very first academic institution of the kind in the former Kingdom of Serbs, Croats and Slovenes. The first Head of the Clinic was Professor Laza Stanojević from Vienna, whose collaborates implemented their pioneer experience gained in the newly founded Institution for subsequent establishment of the same institutions in other towns of the former country (Radoslav Lopašić in Zagreb, Dimitrije Dimitrijević in Sarajevo). In 1935, after years-long temporary seat within the Hospital for Mental Diseases in Guberevac, the Clinic was moved to the Nerve Department located in the left wing of the previous building of the Institute of Anatomy. At the time, hospital bed capacity of the Institute was approximately forty, accommodated in nine hospital rooms. The Clinic also owned at the time 185 scientific books and 13 journals. The Clinic has occupied a part of its current building since 1936. During the nazi occupation (1941-1945) the Clinic was forcefully moved out from its premisses and at the same time the department of nerve diseases of the Vermacht military medical corps was moved in. In 1994, psychiatric department with 72 hospital beds was added to the Clinic, as well as single-floor building with 45 beds four years later – the precedent of the current clinic of pediatric neuropsychiatry. By the end of 1956, the Clinic of Neuropsychiatry assumed its current architectural form after construction of a new wing which led to increase of the capacity to 117 hospital beds and establishment of clinical departments and well-kept outpatient offices, lecture hall and x-ray room. November 11th, 1972 is considered to be the date of initiation of special development of neurology within the Clinic of Neuropsychiatry in Belgrade, when the decision was made for certain departments to be specially dedicated only to neurological patients for the purpose of higher quality of clinical evaluation. In May 1973, The Clinic was organized in highly specialized neurological departments reflecting professional and scientific interests of the medical teams of the time: Department of Systematic Progressive Neurological Diseases, Department of Spinal Cord, Peripheral Nervous System and Muscular System Diseases, Department for Higher Brain Function Disorders, Department of Convulsive Disorders and Department for Disseminated Diseases of the Nervous System. 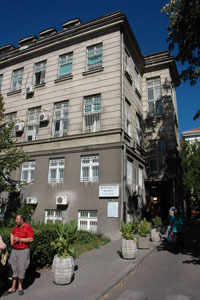 The Clinic of Neurology was founded on March 1st, 1983 and in the same year it became a constituent of the University Clinical Center (UCC) in Belgrade. Founding of the independent Clinic of Neurology led to rapid development of neurology. In 1991, Clinic of Neurology was renamed into Institute of Neurology. The last years of the previous century were characterized by professional isolation, out-of-dating of equipment, deterioration of quality of work and exceptional efforts of the staff within an attempt to overcome difficulties resulting from the circumstances generally prevailing at the time. Beginning of the 21st century brought to the Institute new enthusiasm. Partial reconstruction of the building was initiated as well as revitalization of clinical services, replacement of the obsolete equipment, reorganization based on the contemporary standards and harmonization with professional and research needs and rearrangement within the international research projects. The Neurology clinic has maintained regular contacts and enabled professional training to a significant number of its experts in the most renowned world centers (National Hospital at Queen Square in London, Hudinge Hospital within Karolinska Institute in Sweden, Baylor University in Houston, Columbia University in New York, as well as clinics in Grac, Innsbruck, Rostock, etc.). The Institute participated in a number of significant international projects ("Head Injury Program", "Complex research of multiple sclerosis", etc.) as well as in organization of both national and international scientific meetings. Over the period after the World War II, The Neurology clinic had the opportunity to be the host of the most acclaimed world experts in the field of neurology. including R. Wartenberg (USA), H. Link (Sweden), C. Poser (USA), S. Feldman (Israel), M. Sugita (Japan), S. Emery (USA), H. Mauer-Rienecker (Germany), H. Lechner (Austria), D. Chedwick (Great Britain), J. van Gijn (Holland) etc., who delivered their lectures at the Institute.